If you are learning how to cook swordfish, it is important to know that this fish is a coarse textured and strong flavored fish. It is an oily fish therefore is very popular in broiling and grilling. The downside of this fish is that the Food and Drug warns of it carrying high levels of mercury; warnings are often issued to pregnant women and children. Aside from this warning, most people learning how to cook swordfish are totally pleased with the mild flavor and meaty texture of this fish. The product of this American dining tradition can be found along both coasts of the United States. Because this fish grows to such a large size (up to 14 feet long weighing up to 1400 pounds) the fish meat can be cut into many nice steaks. These are perfect for grilling and broiling to serve in restaurants. The high fat of this saltwater fish, unlike the leaner fish is distributed through the flesh. Because this fat melts when heated and moistens the meat, the flavor is especially great using the dry heat methods such as the grilling and broiling. Frying would not be suited to cook swordfish because of the fat content it already has. 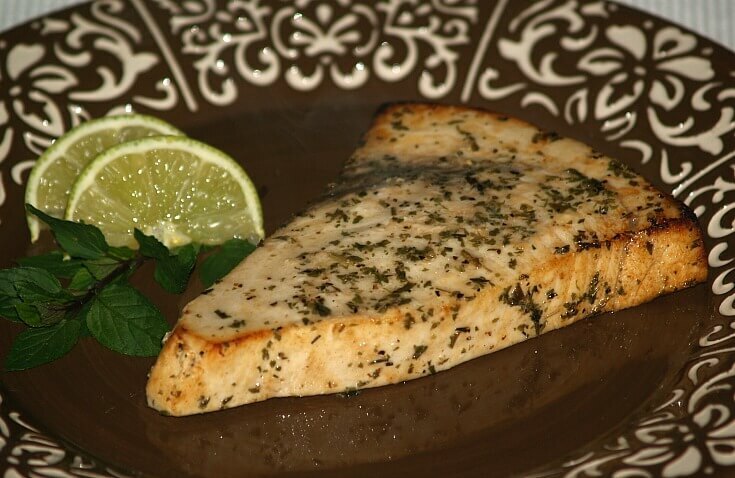 Baking swordfish with simple herbs for seasoning will also yield a very tasty entrée. NOTE: The extra fat in swordfish which adds to the flavor also sometimes accumulates a stronger “fishy” taste. For this reason, I like to soak the fish is cold salt water for a couple of hours before cooking. If the recipe is for marinating the fish, I soak in salt water before the marinating. Learn how to cook swordfish on the grill with the flavors of India. Place swordfish steaks in heavy duty zip lock bag. Combine yogurt and next 9 ingredients in small bowl; blend well. Reserve HALF of the marinade; pour remaining over the fish. Seal bag tightly and shake gently until steaks are well coated. Marinate in the refrigerator for 2 hours turning occasionally. Remove steaks from the marinade and DISCARD marinade. Coat grilling rack with cooking spray; place over medium hot coals or place under hot broiler. 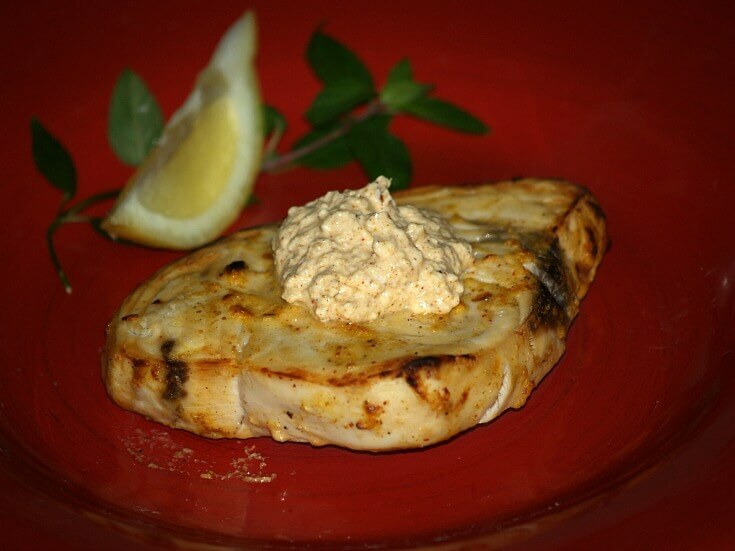 Place swordfish steaks on grilling rack; cook 10 minutes on each side. NOTE: Steaks should flake when tested with a fork. Serve with reserved marinade; serves 4. Mix all ingredients in a bowl except the swordfish. Bake 8 minutes on each side. 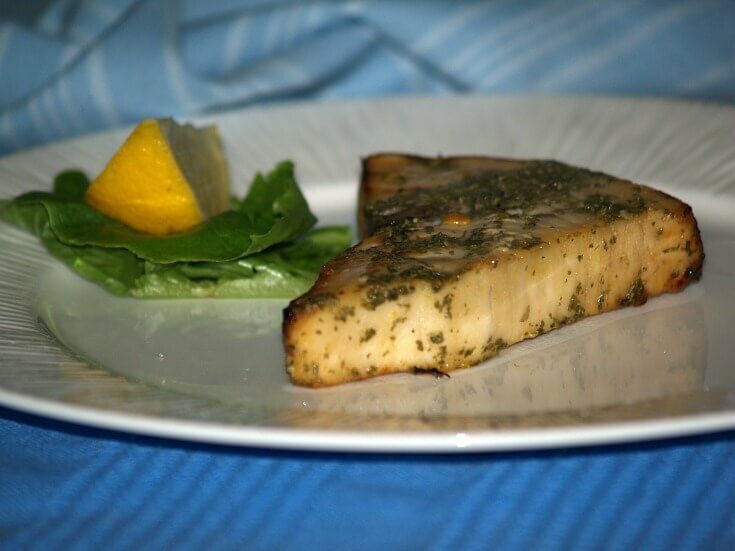 Learn how to cook swordfish by broiling. Place steaks in a large shallow dish. In a small bowl combine oil, vinegar, bay leaves and parsley. Add and blend in salt, Worcestershire sauce, tarragon and pepper. Pour mixture over the swordfish steaks; cover and refrigerate 30 minutes. NOTE: Turn fish occasionally to coat. Preheat broiler; place fish on broiling rack. Use remaining marinade to spoon over fish while broiling. Broil fish for 15 minutes or until it flakes when gently touched with fork. Serve with lime wedges; serves 6. A delicious recipe to learn how to cook swordfish. Spray 7x11 inch baking dish. Combine the sun dried tomatoes and water in a bowl and let stand about 10 minutes, then drain and coarsely chop tomatoes. Sauté the scallions and garlic in the oil over medium heat. Stir in 1 teaspoon paprika and the chili powder and cook about 1 minute. In a medium bowl combine the sun dried tomatoes, half of the scallion mixture, the fresh tomatoes, 2 tablespoons of the basil and the orange juice and set aside. Lay the fish on a work board and sprinkle with salt and pepper. Arrange the fish in the baking pan. Top fish with the remaining scallion mixture and 2 tablespoons of basil. Sprinkle the remaining 1 teaspoon paprika and the Parmesan cheese on top of the fish. Bake about fish flakes when touched with a fork (about 10 minutes). Serve the tomato mixture with the fish. Learn how to cook swordfish with a lemon yogurt sauce. COMBINE and blend all ingredients; chill until ready to serve. WASH swordfish steaks with clean cold water; pat dry. Combine butter, soy sauce, garlic, salt and pepper; blend and spread evenly over each steak. In large skillet sear steaks on both sides until golden brown turning over 1 time. NOTE: Fish will flake easily when tested with a fork. Top with sesame seeds; drizzle sauce over plate and arrange fish on top of sauce. Learn how to cook swordfish with avocado butter. Combine soy sauce, lemon peel, juice, garlic, mustard and oil in food processor. Process soy mixture to a smooth marinade. Place steaks in shallow casserole dish; pierce steaks with tines of fork. Pour marinade over the steaks; let stand in refrigerator 4 to 6 hours. PREPARE BUTTER while steaks are marinating. Combine butter, avocado, lemon juice, parsley and garlic in food processor. Process butter mixture until smooth; shape s log roll on parchment paper. Roll up in the parchment paper; freeze until ready to serve. Remove fish steaks from the marinade; grill until done turning only 1 time. To serve place a slice of the butter on top of steak; garnish with lemon wedge and parsley. Learn how to cook swordfish and serve with anchovy caper sauce. Place fish steaks in large zip lock bag. Combine juices, olive oil, salt and pepper; pour marinade over the steaks. Seal bag tightly; marinate in refrigerator for 3 to 4 hours turning occasionally. Remove steaks from marinade and discard marinade; brush gill rack with oil. Place fish on medium hot grill; cook 5 minutes on each side until fish flakes. TO MAKE SAUCE combine all sauce ingredients; blend well. Spoon over fish to serve; makes 4 servings/ 1 cup of sauce. Learn how to cook swordfish with a spicy pepper cashew crust. Combine cashews and pepper in a shallow dish; coat both sides of swordfish with mixture. Heat oil in large skillet over medium heat; add swordfish. Cook fish 10 minutes on each side until fish flakes easily when tested with fork. Garnish with basil sprigs; serves 4. Place steaks in a large heavy duty plastic bag. Combine wine and next 4 ingredients in blender; process for 30 seconds. Pour ¾ cup of the marinade over the swordfish steaks; seal bag tightly. Refrigerate swordfish for 3 hours turning occasionally. Chill remaining marinade to use for basting during cooking. Coat 9X13 inch baking dish with cooking spray; place steaks in dish. Sprinkle ¼ teaspoon hickory salt over fish. Bake 15 minutes or until fish flakes when tested with fork. Sprinkle fish with remaining hickory smoked salt; serves 5.